We sometimes get questions about where to play Go in Albuquerque. 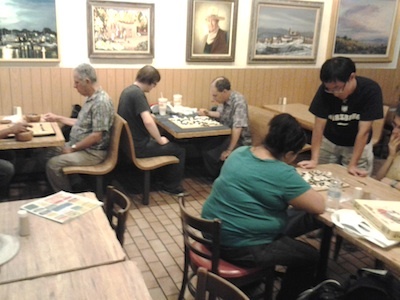 Players have been meeting at the Frontier Restaurant for many years and meet on Wednesdays at 7pm. The Frontier is located at the corner of Cornell and Central, right across from the University of New Mexico campus. See the map below. “We play in the next to last section towards the alley. All are welcome, but please bring equipment if you can: it increases your chances of getting a game” says Bob Gilman (5k) who took the picture.